Sarah joins Resonance Ensemble for their Intensive Care concert on June 9. Tickets available here! Sarah joins the Portland Opera Chorus for Big Night on May 11 at Keller Auditorium. Tickets available here! 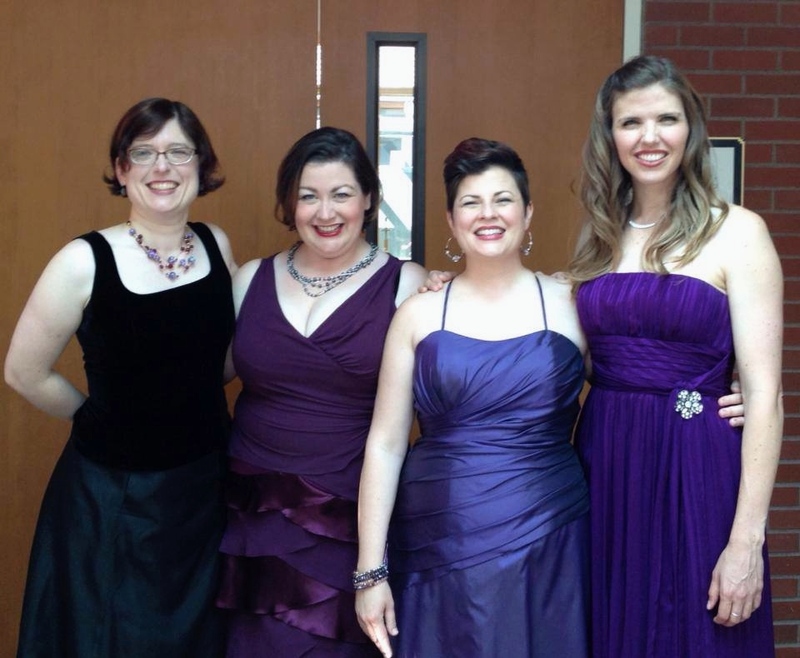 Sarah joins Resonance Ensemble for their Women Singing Women concert on February 3 and May 18. Tickets available here! Sarah joins the panel of speakers for Optimizing Care Across the Gender Spectrum at Pacific University on April 6th. Speech-language pathologists, educators and singing voice instructors serve individuals from across the gender spectrum. Join us for a one-day workshop on Saturday, April 6. Build your knowledge and confidence in working with children, adolescents, and adults who are gender diverse. We have assembled outstanding speakers who will inspire compassion and provide you with tools to serve in schools, higher education, and medical settings. The afternoon sessions provide an option to build specific skills in authentic voice and communication or to focus on skill building and ways to support LGBTQ+ youth in educational settings. Performing music by Jeff Winslow and David Bernstein, Sarah joins Fear No Music for the Cascadia Composers 10 year anniversary Founders Concert on March 22 at 7:30pm at PSU Lincoln Hall. Cascade NATS hosts Matt Edwards for a CCM Symposium at the University of Portland. Sarah coordinates the event together with the NATS board of directors. Voice teachers, choir directors, collaborative pianists, and anyone interested in teaching singers styles other than classical, register here. Students from UP participate in the 2018 Classical NATS Student Auditions on January 26th and 27th at the University of Portland. Sarah participates in the auditions as a member and the NATS Chapter President. Sarah plays Judith Davenport in the Broadway Rose Theatre production of A 1940's Radio Christmas Carol, from November 21-December 23. Tickets available here! THE MAINESTUDIO Fall Recital will be held at the University of Portland Recital Hall on Saturday, November 3 at 8 pm. THE MAINESTUDIO and UP students participate in the Cascade Musical Theatre NATS student auditions at Western Oregon State University on November 10th and 11th. Sarah sings with the Portland Opera Chorus for Portland Opera's production of Orfeo ed Euridice. July 27, 29, 31, August 2, 4, Keller Auditorium. Sarah sings the role of Margaret in The Light in the Piazza with Mock's Crest. Performances are July 9-24 at the University of Portland. Ticket information here. THE MAINESTUDIO Summer Recital will be held at the University of Portland Recital Hall on Saturday, May 19 at 7 pm. Sarah sings with the Portland Opera Chorus for Portland Opera's Big Night gala concert. April 14th, 7:30 pm, Keller Auditorium. THE MAINESTUDIO offers a masterclass with soprano Erin McCarthy and collaborative pianist Susan McDaniel. Sunday, March 18th at 2:30 pm, at the University of Portland Recital Hall. Sarah joins Resonance Ensemble for SOULS: Mythical Understandings finding common ground in uncommon times. Sarah performs several featured solos in local composer Theresa Koon's new song cycle set to twelve Sufi pieces. February 15 at 2 pm, at First Presbyterian Church: FREE. Students from UP participate in the 2018 Classical NATS Student Auditions on January 27th and 28th at the University of Portland. Sarah participates in the auditions as a member and the NATS Chapter President. THE MAINESTUDIO Winter Recital will be held at the University of Portland Recital Hall on Sunday, December 17 at 7 pm. Students from both UP and The Mainestudio participate in the 2017 Musical Theatre NATS Student Auditions on November 18th and 19th at Marylhurst University. Student Lana Sage won her category and qualified for the NW Regional round of auditions. Sarah participates in the auditions as a member and the NATS Chapter President. Sarah serves on the site host team and attends workshops at the NW Regional NATS conference in Portland on October 27-29. Come see Sarah perform for Portland Summerfest at Changing Places, a Light, Music, and Art Installation at the Keller Fountain on Wednesday, September 13th at 5 pm. Sarah will sing arias, duets, and trios with soprano Amy Hansen, baritone Robb Harrison, and collaborative pianist Chuck Dillard. Sarah joins the Portland Opera for Opera A La Cart at the Forest Grove Farmers Market at 5 pm on July 26th. Inspired by Portland’s food cart culture, Opera a la Cart is Portland Opera’s new mobile performance venue that will bring opera directly to the community in pop-up performances. Designed and built by architecture students at PSU, the cart will feature a fold-out stage and a “menu” of operatic specials du jour. Charismatic young singers will perform arias, duets, and ensemble pieces. Opera a la Cart will travel to food cart pods, farmers markets, college campuses, neighborhood festivals, and other locations where people gather. The Linfield College Concert Choir and Chamber Orchestra performs the Haydn Missa Sancti Nicolai (“Nicolai Mass”) on Sunday, May 14th at 4 pm in Ice Auditorium. Sarah joins as the mezzo soloist. Students from both UP and The Mainestudio participate in the 2017 Classical NATS Student Auditions on January 28 at Pacific University. Sarah manages the auditions as the NATS Auditions Chair. THE MAINESTUDIO Winter Recital will be held at the University of Portland Recital Hall on Friday, December 9 at 7:30 pm. Sarah teaches a workshop on The Aging Voice on December 6th for the Portland First Unitarian Universalist Church choir. Students from both UP and The Mainestudio participate in the 2016 Musical Theater NATS Student Auditions on November 5 at Lewis and Clark College. Sarah manages the auditions as the NATS Auditions Chair. November 13th: Sarah joins the Vancouver Unitarian Universalist Church choir for their fall retreat, teaching a workshop on The Aging Voice. Sarah joins the voice faculty of the University of Portland. Sarah joins Lakewood Theatre to play Claudia in the musical Nine. Show dates are from July 8-August 14. Sarah teaches Mind Your Registers: A Workshop for Belters for the Laura Thoreson Studio of Voice, at the University of Portland on June 4, from 11 am-1 pm. THE MAINESTUDIO Spring Recital will be held at Vermont Hills United Methodist Church on Friday, May 20 at 7:30 pm. Join soprano Erin McCarthy, collaborative pianist Susan McDaniel, and mezzo-soprano Sarah Maines on Sunday, May 22 for Mozart, Musicals, and Merlot: a Vocal Chamber Recital. This program is part of the Red Barn Recital Series at Fermata Farm. Starting March 19, Sarah joins the teaching staff for The Heart of Kirtan, a 6-week intensive Kirtan workshop hosted by Heather and Benjy Wertheimer of Shantala Music. 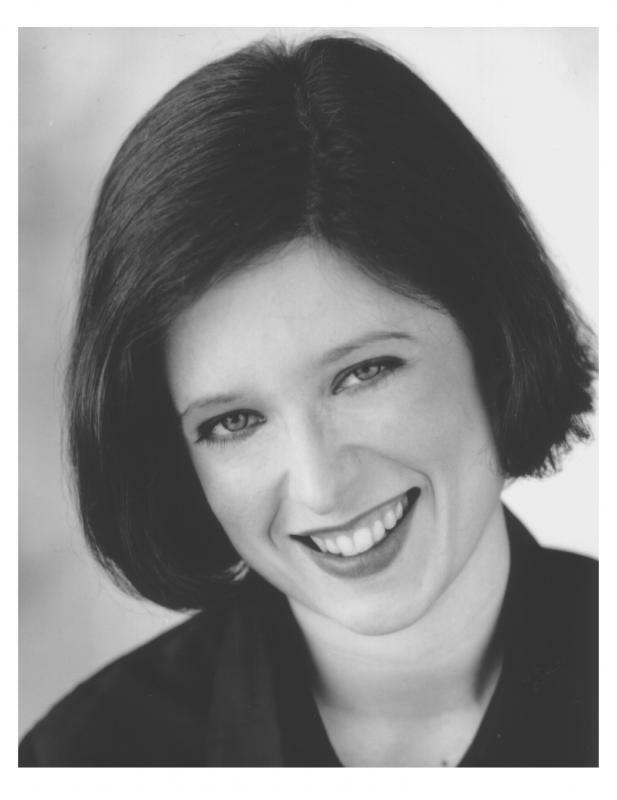 The Mainestudio and the Erin G. McCarthy voice studio will co-host a Spring Masterclass with mezzo-soprano Jamie Jacobson and collaborative pianist Susan McDaniel. This event is scheduled for Saturday, March 12, and will be held at Vermont Hills United Methodist Church. Singers may choose from two Masterclass sessions: 1-3 pm, and 3:30-5:30 pm. Contact Sarah directly to sign up for this event. Sarah will join Resonance Ensemble in Seattle for a performance of the Distler Totentanz at the American Choral Director's Association conference on Friday, March 4, 2016. This exciting invitation will showcase Resonance in front of the choral conductors of the Pacific Northwest at Seattle's Town Hall. While in Seattle, Sarah will attend the NW Regional National Association of Teacher's of Singing Convention on Saturday, March 5th. Sarah will join Alexis Moore Eytinge and multiple other wonderful Portland musicians for the Share The Love aka The Disney Cabaret at Vie de Boheme on Thursday, February 11th at 7 pm. Check out all the details at the Facebook event here. The Cascade Chapter of the National Association of Teachers of Singing hosts Classical Student Auditions at the University of Portland on January 29 and 30. Sarah serves at the Auditions co-chair, organizing the event with 155 singers and 30+ voice teachers. In addition, Sarah was recently appointed the Cascade NATS Chapter President-Elect. THE MAINESTUDIO Winter Recital will be held at Vermont Hills United Methodist Church on Friday, December 11 at 7:30 pm. 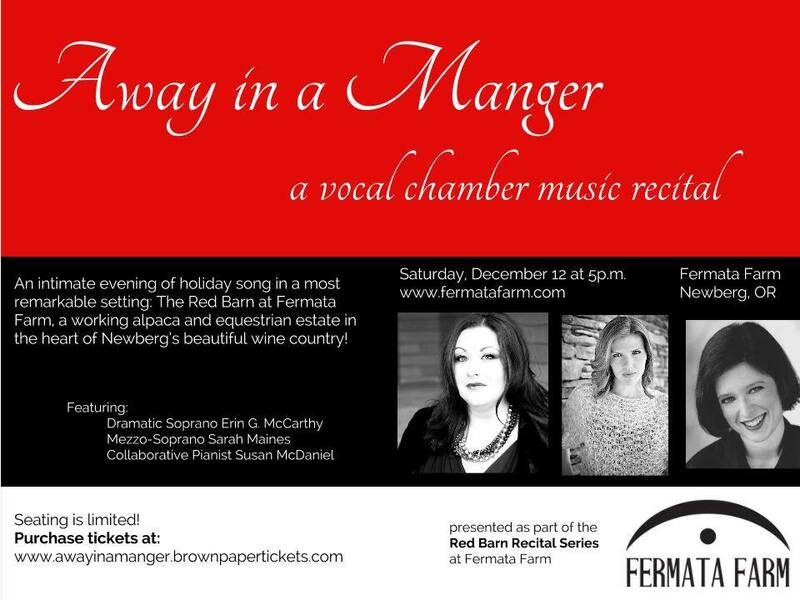 Join mezzo-soprano Sarah Maines, soprano Erin McCarthy, and pianist Susan McDaniels for a beautiful holiday recital at Fermata Farm! Choose from two performances: Saturday, December 12 at 5 pm, or Sunday, December 20 at 5 pm. This is a very special venue for holiday repertoire: in a gorgeous barn! Tickets are limited: visit www.awayinamanger.brownpapertickets.com for more information. Sarah performs patriotic songs for "Honor Their Service" A Veteran's Day Tribute at the Lake Oswego City Hall, from 2-4 pm on Wednesday, November 11. Sarah serves at the Student Auditions Coordinator for the NATS Cascade Chapter Music Theater Auditions at Western Oregon University on Saturday, November 7th. Congratulations to student Natalie Brauser for placing second in her category! Sarah joins Resonance Ensemble for a Halloween Concert: Dance of Death at Trinity Episcopal Cathedral on Saturday, October 31st at 7:30 pm. Ticket information available here. Check out this fun feature on the Resonance Ensemble FB page! Sarah joins the Portland Opera Chorus for a concert of choral works at the First Congregational United Church of Christ on October 6. See the full press release here. Sarah performs Mozart duets and arias at a private arts event in McMinville, Oregon. Sarah plays Cousin Hebe in HMS Pinafore with Mock's Crest. Performances are every weekend in June: ticket information here. Check out this great review of the show! THE MAINESTUDIO Spring Recital will be held at Vermont Hills United Methodist Church on Friday, May 15 at 7:30 pm. Sarah joins the Front Royal Oratorio Society as the alto soloist for the Mozart Requiem. Sarah joins the Portland Opera Chorus for Carmen. Performances are the first two weekends of February: Tickets available here. Sarah lectures on vocal health at Corban University in Salem, Oregon on January 27. Christ United Methodist Church hosts Sarah as the featured musical guest for "River City House of Praise", a live radio show-style worship service. THE MAINESTUDIO Winter Recital will be held at Vermont Hills United Methodist Church on Friday, December 12 at 8 pm. Voices for the Performing Arts hosts Sarah as the alto soloist for The Messiah. Eastern Mennonite University hosts Sarah on November 20 for lectures on vocal health and function. The Arts Chorale of Winchester hosts Sarah as the featured mezzo-soprano soloist in their performance of the Mozart Requiem. Mezzo-soprano Sarah Maines joins Erin Anderson McCarthy, soprano and Susan McDaniel, piano for a recital of vocal chamber music. Eastern Oregon University hosts Sarah on November 13 and 14 for a series of masterclasses, lectures, and a recital featuring vocal diverse vocal styles. Read a full local press release about the trip here. Sarah performs patriotic songs with the Red Lantern Ensemble at the "Honor Their Service" Veteran's Day Tribute in Lake Oswego, Oregon. Mezzo-soprano Sarah Maines joins Anne Young, piano, and LeAnn McKenna, flute, to perform Ravel's Chansons madecasses as well as selections by Handel and Moore. 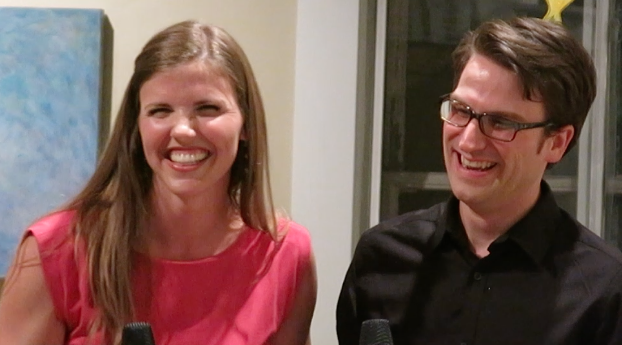 Mezzo-soprano Sarah Maines joins Baltimore tenor Andrew Hann to perform beloved musical theatre duets. Jester Educational Theatre collaborates with Sarah to present a musical theatre comedy workshop for young actors. Find your funny bone! Rocking a comedic song often involves making strong vocal choices. Kids will learn new vocal tools to amp up the comedy in this targeted workshop. Every participant must come prepared with a comedic song from a musical, as well as a recorded accompaniment on CD or MP3. Need song suggestions? Contact Dr. Maines at themainestudio@gmail.com. THE MAINESTUDIO Spring Recital will be held at Vermont Hills United Methodist Church on Saturday, June 7 at 7 pm. Mezzo-soprano Sarah Maines joins sopranos Natalie Gunn and Erin Anderson McCarthy as well as pianist Susan McDaniel for a recital of vocal chamber music. $20 advance tickets include a wine reception: contact www.themainestudio.com to reserve a seat. Donations for charity encouraged at the door. 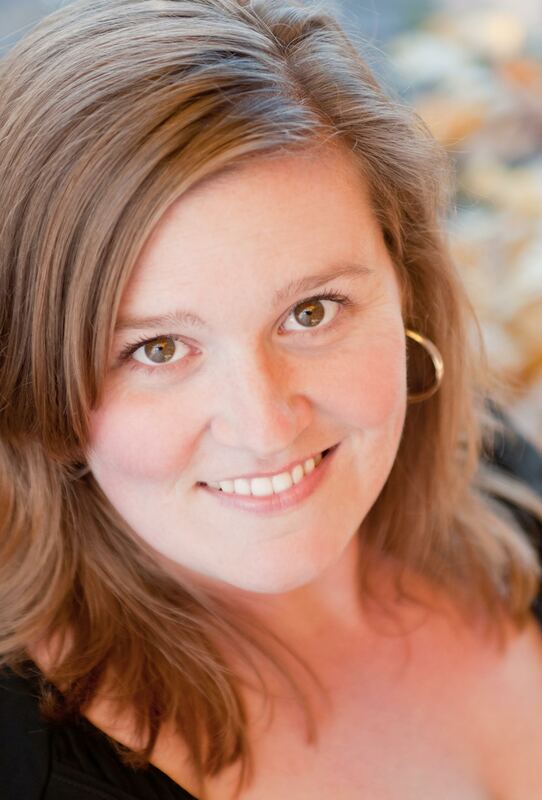 Sarah is a featured lecturer and voice teacher at Eastern Oregon University on May 4 and 5. See the full press release here. Get those jazz vibes as Sarah joins Bethany Small, Alexis Eytinge, and Mont Chris Hubbard for a vintage gathering of music and art, in the salon style. Period dress welcome and encouraged, to fit the dapper mood. Free admission: bring a bottle of wine to share. Sarah joins professional Portland choir Resonance Ensemble for their May performance. Resonance performs new music from the Pacific Northwest and Scandinavia exploring the beauty and spiritual connection of the natural world. Featuring a commission by local composer Renee Favand-See and works by Cascadia Composers. Jester Educational Theatre collaborates with Sarah to present an articulation and projection workshop for young actors. The "Peter Picked a Peck Project"
$10 pre-registration/early payment, $12 at the door, and $8 if you've appeared in a JET performance. Cash and credit card preferred, checks acceptable. Fifteen people max. 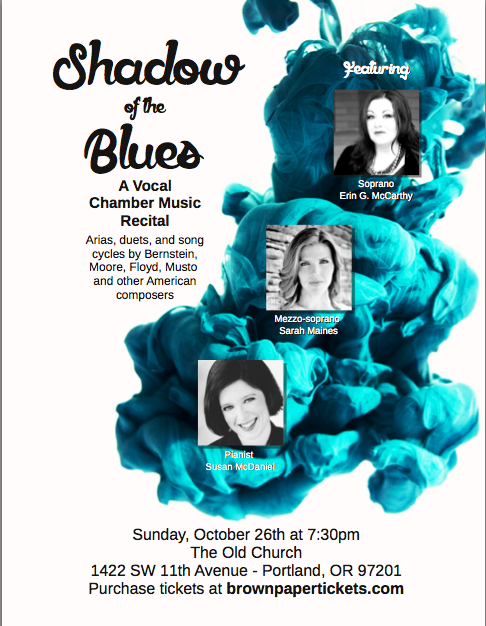 Mezzo-soprano Sarah joins sopranos Natalie Gunn and Erin Anderson McCarthy as well as pianist Susan McDaniel for a recital of vocal chamber music. Aladdin, Jr, co-directed by Sarah Maines and Molley Stuckey, opens at Stoller Middle School on January 22. Sarah begins rehearsals of Zombiella the Musical , a musical comedy written by local playwright Sally Stember and directed by Paul Bright. The show opens January 26th, as part of Portland's Fertile Ground festival. During a two-week trip to Virginia and Maryland, Sarah taught lessons and a masterclass, performed the Handel Messiah with the Piedmont Symphony Orchestra and the Saint-Saens Christmas Oratorio with the Maryland Chamber Orchestra. Sarah was also the featured artist at Christ United Methodist Church's "River City House of Praise" radio theatre worship service, and sang multiple holiday masses at St. Thomas More Catholic Church. THE MAINESTUDIO Spring Recital will be held at Vermont Hills United Methodist Church on Wednesday, December 18 at 7 pm. Sarah attends the Cascade NATS Chapter Fall Classical Festival in Eugene, Oregon, and begins teaching a bi-monthly Voice Workshop series at First United Methodist Church in Portland. She also begins singing with Jumptown Big Band and joins the staff of The Young People's Theatre Project. She will co-direct Aladdin, Jr. at Stoller Middle School through the YPTP Second Stage Residency program. Sarah teaches workshops on vocal anatomy, function, and health for the choral programs at Jesuit High School and Meadow Park Middle School. Sarah received an invitation to submit two exercises for publication in the new textbook "The Vocal Athlete: Application and Technique for the Hybrid Singer" by Wendy D. LeBorgne, Ph.D. CCC-SLP and Marci Daniels Rosenberg, M.S. CCC-SLP., through Plural Publishing. The textbook will be available in the early spring of 2014. Dr. Maines' exercises will appear in the supplemental workbook, along with many other exercises from voice pedagogues, voice pathologists and singing voice specialists who work with commercial music vocal athletes. Sarah returns from PEVOC 2013 in Prague, where she presented research on voice efficiency and co-taught a workshop on voice pedagogy curriculum development.